RAF Lakenheath's 56th and 57th Rescue Squadrons train for different scenarios in Scotland-based multinational exercise known as Joint Warrior 15-1. They train for air-to-air combat missions, are rapidly deployable, execute worldwide combat search and rescue (CSAR), and sustain operations around the world during both war and peace. They are RAF Lakenheath’s 56th and 57th Rescue Squadrons, comprised of two weapon systems: the HH-60G Pave Hawks and the Guardian Angel pararescuemen, respectively. Both squadrons recently completed a two-week, multinational exercise known as Joint Warrior 15-1 in Scotland. 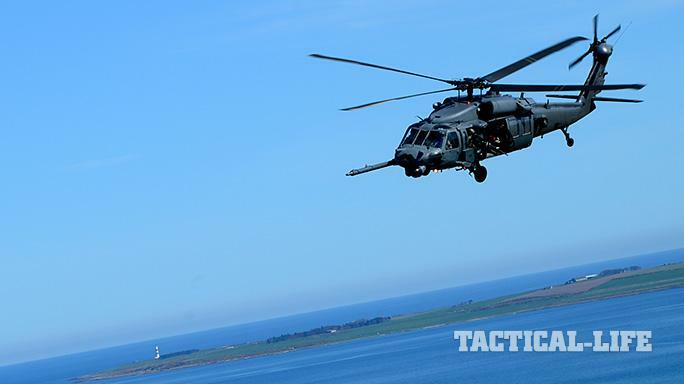 Special mission aviators , like Flores, are tasked with firing the Pave Hawk’s .50-caliber machine gun. They also provide CSAR capabilities for both their aircrew and downed personnel, control the aircraft’s hoist and provide protection to the aircraft using their weapons. During the multinational training, military personnel from 14 countries practiced threat-reaction scenarios and flew long missions, both day and night. According to Flores, the rescue squadrons find it important to attend exercises like Joint Warrior, to train in various types of situations. During the exercise, they performed tactical combat maneuvers over both land and sea to prepare for real-world operations. Practicing flying and operating in different environments is an essential part of training for special mission operations, as the squadron can respond to incidents worldwide. “We train for personnel recovery, combat search and rescue missions, medical evacuations; basically a wide variety of what the helicopter can provide,” Flores added. The Guardian Angel pararescuemen, also known as PJs, are responsible for recovering and medically treating personnel involved in hazardous situations. These elite, combat forces are trained to survive in harsh environments. 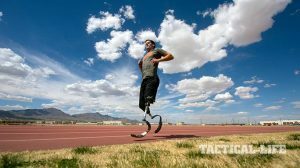 The pararescue community is small, which provides motive for the PJs to work closely together, in an integrated working environment. For Airmen like Flores, who are new to the unit, getting to know the people you fly and train with can be vital. Joint Warrior provided them the opportunity to work closely with not only their units, but also military members from different countries. “It’s a great opportunity for us to teach about combat search and rescue, personnel recovery, as well as build that partnership with our allies that play in the exercise and learn about their contribution to future combat capabilities,” Jensen said. Having open communication and learning from one another is a concept that is greatly enforced during these multinational exercises.